Maine may not have Minnesota’s license plate bragging rights when it comes to the state’s number of lakes. But the northeastern state has enough lakes to make manually gathering enough data for a statewide look at water quality into a tall order. In an effort to include as many of those lakes as possible–even the remote ones scientists rarely access–in regional water quality assessments, the state turned to satellite data that can be used to estimate lake clarity. The results of a study using the data published online in June by the journal Freshwater Science show that clarity in the state’s lakes decreased on average by around half a meter from 1995-2010. McCullough, now a doctoral student at the University of California Santa Barbara, led the study as a masters student at the University of Maine. He said that water clarity is highly correlated with other water quality metrics like chlorophyll and phosphorus, but is much easier and cheaper to measure. That makes it an ideal parameter for local volunteers and students to track because they can easily be trained to use a Secchi disk to collect clarity data. While volunteer-based clarity measurements are reliable for tracking the health of individual lakes, the aggregated data from a state’s citizen monitoring program might not necessarily be representative of water quality across the region. That’s because the lakes under those programs are generally monitored for a reason, rather than at random. As a result, remote lakes can be underrepresented in a statewide sample. McCullough and his coauthors turned to data from the Earth-sensing Landsat satellite program, which measures electromagnetic radiation, among other things. 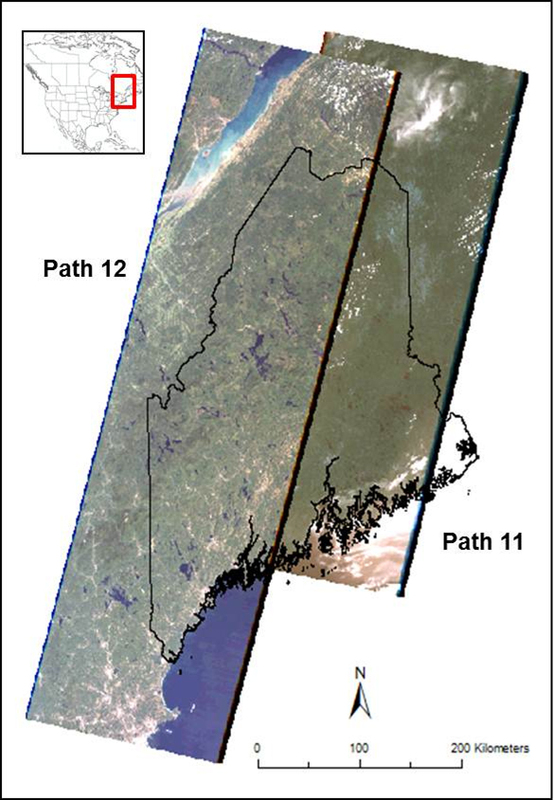 The researchers isolated data the satellites’ sensors recorded as they passed over Maine from 1995-2010. To estimate lake clarity, the focused on the blue and red sections of the visible portion of the electromagnetic spectrum. Though the resolution of the satellite sensors limited their assessment to lakes larger than 8 hectares, the researchers were still able to estimate the clarity of more than 1,500 lakes over the study period, McCullough said. That’s much better coverage than the state’s field assessment program. For example, the researchers estimated clarity of 633 lakes for the year 2010. The field program only had data for 71 lakes over the same time period. The study found that on average, the clarity of lakes across the state declined by around half a meter. McCullough said a half-meter fluctuation in clarity isn’t unprecedented, but it’s a trend worth tracking, especially with the potential for warming temperatures and longer growing seasons associated with climate change to increase algal growth. Though satellite data can provide wider coverage of Maine’s lakes than a field monitoring program, it’s no replacement for the data collected by the states dedicated volunteers, McCullough said.